Jurnal Akuntansi Aktual (p-ISSN: 2087-9695; e-ISSN: 2580-1015) is a peer-reviewed journal published by Department of Accounting, Faculty of Economics, Universitas Negeri Malang on a regular basis (January and June). 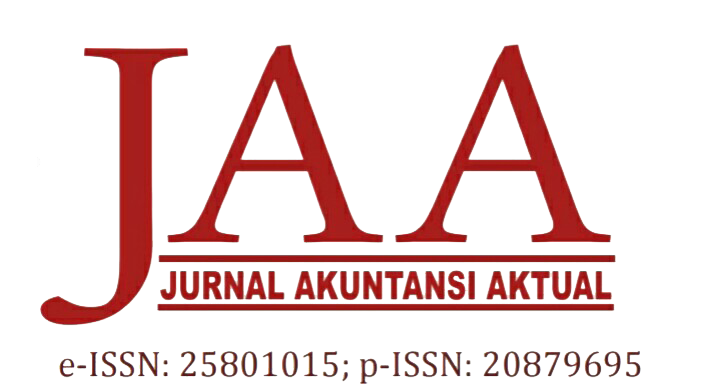 Jurnal Akuntansi Aktual encourages academics and (or) researchers to disseminate the results of empirical research and conceptual critical review of contemporary accounting issues of national and international interest. Jurnal Akuntansi Aktual publishes articles from wide range of accounting issues in the field of financial accounting, cost accounting, management accounting, behavioral accounting, accounting sharia, public sector accounting, taxation, auditing, accounting information system and finance. Articles submitted can be drawn from any research paradigm such as positivism, interpretivism, criticism and postmodernism paradigm.